Serial boards that are designed for ISA slots provide an excellent and cost-effective solution when working with legacy devices and PCs. 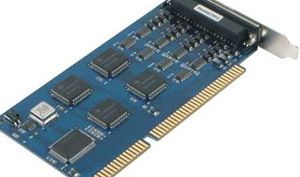 Moxa offers a large selection of ISA boards for serial communication applications, which require reliable performance and industrial-grade features. CI-134 4 RS-422/485 921,6 Kbps max baudrate Ja Ja DB9 Male-kabel medföljer. Built-in termination resistors. RS-485 data direction control med ADDC eller RTS.